Shepard, 47, was a Navy captain on his second spaceflight (he'd flown previously as the first American in space on Mercury Redstone 3), Roosa, 37, was an Air Force major on his first spaceflight, and Mitchell, 40, was a Navy commander also on his first spaceflight. 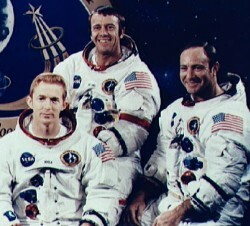 The backup crew for this mission was Eugene Cernan, Ronald Evans, and Joe Engle. he Apollo 14 command module "Kitty Hawk" is currently on display at the Astronaut Hall of Fame in Titusville, Florida. Apollo 14 was the third mission in which humans walked on the lunar surface. 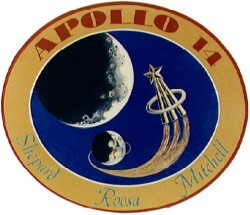 Apollo 14 was launched on 31 January 1971 from pad 39A of Kennedy Space Center on a Saturn V.
On 5 February 1971 Commander Alan B. Shepard, Jr. and LM pilot Edgar D. Mitchell landed in the hilly upland region 24 km north of the rim of Fra Mauro crater at 3.6 S, 17.5 W.
The astronauts made two moonwalk EVA's totaling 9 hours, 23 minutes, one on 5 February and one on 6 February, during which the Apollo lunar surface experiments package (ALSEP) was placed on the surface of the moon, 42.9 kg of lunar samples were acquired, and photographs were taken. At the end of the second EVA Shepard hit two golf balls. Experiments were also performed from the CSM in equatorial orbit. The LM took off from the Moon on 6 February and the astronauts returned to Earth on 9 February. 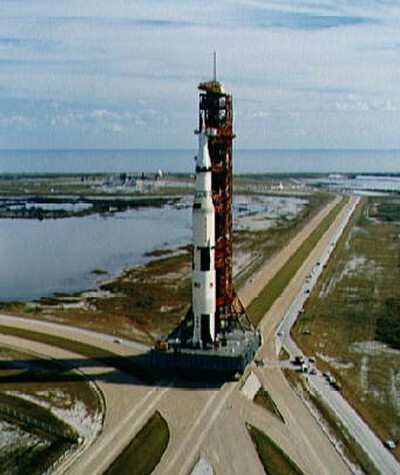 Performance of the spacecraft, the third of the Apollo H-series missions, was good for most aspects of the mission. The primary mission goals of deployment of the ALSEP and other scientific experiments, collection of lunar samples, surface photography, and photography, radio science and other scientific experiments from orbit were achieved with the exception of the full coverage planned for the Hycon camera.